With all the bigger-is-better, too-big-to-fail, merger mania that has swept the country in the last, say, 25 to 50 years, we have lost knowledge of where our food comes from. Many of these large companies don’t want you to know, and don’t want to be burdened with the requisite record keeping to let you know. After all they may not know the exact source and composition of the grain fed to those cows, and which feed lot the cow was at before a piece of its flesh arrived on a white styrofoam tray encased in plastic wrap. The concept of traceability is something many of the food mega-conglomerates would rather not encourage. I often attempt to buy at least some of my food from trace-able sources, and this is often not easy to accomplish. Mega-stores like Whole Foods are probably no better, and it could be argued are actually complicit in the attempts to reduce traceability and consumer knowledge of food sources and composition. Many so called organic products are actually distributed and packaged by some of the largest agricultural entities in the world. Just look at the organic spinach fiasco from 2 years ago propagated by some of the biggest food companies. All you have to do is look at who owns who and you realize that real spinach grew in the ground and needs to have the dirt and sand washed off in a sink. It doesn’t come pre-washed, in little plastic bags pumped full of just the right amount of inert nitrogen and product, then shipped from the Salinas Valley in California to Washington state via Texas. Similarly the peanut butter fiasco of a couple of years ago doesn’t lend any feeling of a safe or trace-able food chain … even companies like locally owned Cougar Mountain cookies were misinformed about the provenance of the peanut butter they were purchasing. A few years ago, I tried to alter at least some of my buying habits to enhance my knowledge of the products I was purchasing, and the companies that made them, and the chain down to the farmer level. As at least some of you know, I make bread, and lots of it. A natural place to start, no? 50 pound sack of unbleached or bread flour from Costco … good price, wow that stuff is cheap … bakes up pretty good too … but ConAgra foods … located pretty close by in Kirkland … “one of North America’s largest packaged foods companies … spent heavily to defeat Oregon’s measure 27, which would have required food companies to label products that contain genetically modified ingredients” (http://en.wikipedia.org/wiki/ConAgra_Foods) … need to look elsewhere. The bulk bins offered no comfort, just exorbitant prices and no labeling I could take home and investigate … no lot codes or expiration dates. This is going to be tougher than I thought. 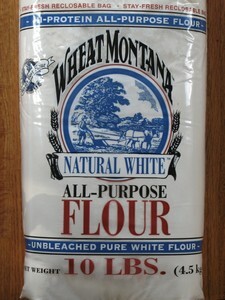 Five or six years ago, as I was perusing the bulk department at Central Market in Shoreline (http://central-market.com/), out of the corner of my eye, I spotted clear 10 pound plastic bags of flour from Wheat Montana (http://wheatmontana.com). I checked ‘em out … family farm (Folkvord), operate their own mill … 12000 acres … Montana … sustainable farming practices. It’s very nice flour (Natural White, Prarie Gold, Bronze Chief). The Natural White, an unbleached flour has more gluten than a lot of “bread” flours, and the baked goods are great. The mill uses an impact milling process, so the flour only gets to about 95 F during milling. The ingredients list is really short and sweet. Great example of complete control of the growing, milling and distribution chain. And I can find the entire operation on the map. This one’s a keeper. I recently learned that Stone-Buhr (http://stone-buhr.com) sources the wheat berries for its flour from sustainable, independent, small growers right here in the Northwest. Stone-Buhr’s original mill used to be in Fremont (http://stone-buhr.com/story.php). Their all purpose flour is made with wheat from Shepherd’s Grain (http://shepherdsgrain.com). Shepherd’s grain is an alliance of Northwest family farms that promotes something called “sustainable agriculture.” Stone-Buhr has a bit of a checkered past. It began in 1908 and was independently owned and operated until the early 1980′s when it was sold off. Through a series of sales, mergers, acquisitions it ultimately became a brand of Unilever. Josh Dorf and his company JOG distribution acquired it and have partially returned the brand to its roots. JOG is headquartered in San Francisco. The Washington White, Shepherd’s Grain All Purpose Flour has a date code on every bag which allows you to find the farmer (http://findthefarmer.com) who grew the wheat used to make the flour in the bag. The flour is relatively low in gluten content in comparison to Wheat Montana’s offering, so it works very well in cakes, cookies, muffins, pizza dough and other baked goods which don’t require the development of massively elastic doughs. As a baker, I have noticed significant differences between flours, and this is exactly what you should expect when buying from smaller operations. Wheat berries grown in Montana or Washington have different characteristics than if grown in North Dakota, Nebraska or Manitoba. When buying from the the little guys, grains aren’t blended into an anonymous, untraceable mish-mash of pulverized grain speculated on by commodities traders from all over the world, then delivered to your supermarket shelf in a tidy little paper package. In short, we have here, two great examples of traceability, and smaller operations making a difference. Both of these products cost more than the non-traceable product. In both cases, its nice to know there are companies out there, not part of the merger mania interested in delivering quality food grown by farmers and processed by real people at identifiable places. Thanks for the note! In the WA state market I mostly find our products below the cost of our competitors! Especially that crazy knight from New England and those with red roofs…. part of our mantra is that the product should be accesible to the average consumer and not priced too high…. Josh raises a good point about the pricing and indeed the Stone-Buhr flour is lower in price than most all but the store-branded products and the extra large Costco sized packages of Multinational produced products. In the 1970′s I honed my baking skills with Stone-Buhr products, and I’m very pleased to see the new Stone-Buhr is back on my radar after a long absence. And the traceability is there to boot. It is Josh’s ownership and leadership at the company which has brought a great, traceable, local (to the Northwest) product to independent grocers, and even Sam Walton’s stores. Shepherd’s Grain flours are available in 50 pound sacks from some outlets. I get mine from the URM warehouse (open to the public) here in Spokane. Currently, the “low gluten” or all-purpose flour is $13.39 per sack, the “high gluten” or bread flour is $15.79 per sack, and the whole wheat is $13.49. A “soft” or cake flour is also available. These are great prices and the flour is beautiful to work with. I think you could also buy through a local bakery that uses Shepherd’s Grain flours.